My name is Greg. My wife and I are college professors in California. She teaches biology; I teach philosophy. We have two sons. I’m sharing my story with you in so that you may know about this issue and help prevent people from suffering the same fate as I am. It’s too late for thousands of us, but elevating this issue could help others. In 2009 I was very healthy. I commuted to work by bicycle, …worked out at the gym 2-3x per week, and I hiked Half Dome in Yosemite National Park, but I am typing this seated on the couch… the same position I’ve been in since March, 2010. Why? 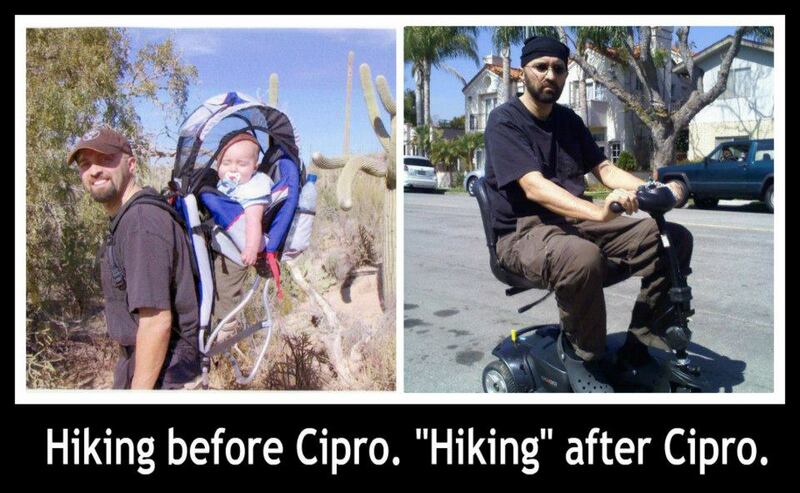 Because now virtually every tendon, ligament, and nerve in my body has been damaged by the antibiotic Cipro. In February of 2010, I took a two week prescription for an antibiotic, Cipro (ciprofloxacin) for a suspected minor infection. One week later, I woke up and it felt like my ankles were on fire. Checking the bottle, I saw that tendonitis was a “black box” warning, so I immediately stopped using the drug and made an appointment with my doctor. I googled tendonitis treatments, and saw that I should immediately implement RICE: Rest, Ice, Compression, Elevation. I called in sick to work and sat on the couch. By the time I saw my doctor a couple days later, the pain had spread to my feet, calves, hamstrings, shoulders and hands. Being very athletic and fit, I was alarmed that my symptoms were spreading. I was used to injuries improving… why were things getting worse? From researching on respected sites such as PubMed, we found that Cipro is a member of a class of antibiotics called fluoroquinolones (or “quinolones” or “FQs”); Cipro and Levaquin are two of the most popular. If you google them, you can immediately see how dangerous they are. Of 30 quinolones that have made it to market since the 1980s, 25 have either been removed from the US market or have severely restricted use (http://en.wikipedia.org/wiki/Quinolone#Generations); that means 83% of these FQs have been banned, restricted, or denied approval by the FDA. By comparison, the good old penicillin antibiotic class has 16 members… not a single one has been withdrawn in over 50 years of use. Since March 2010, my symptoms have not improved at all. Furthermore, I’ve developed new symptoms: I was referred to a neurologist who confirmed I now have peripheral neuropathy… yet another painful side effect of FQs; my neurologist said I was his third patient with FQ side effect damage. A MRI showed that my shoulders’ tendons are chronically damaged and inflamed; bone spurring and inflammation of the bursa are also occurring. My rheumatologist (one of 5 specialists I’ve seen since taking Cipro) confirmed that my joint problems were not the result of any other disease or condition… all this damage is the result of known FQ side effects. Finally, I’ve developed hypothyroidism. I have no family history of any of these conditions and all my bloodwork up until taking Cipro had always not only been normal, but stellar (I’ve always had very low cholesterol, blood pressure, etc.). My health has deteriorated to the point that I must leave my career of over 18 years. I now also have constant tinnitus (ear-ringing) and vision disturbances (necrosis of my left optic nerve) on top of debilitating joint and tendon pain over much of my body. Your piece is both heart-rending and offers reasonable precautions. It’s easy to become emotional or to vent while telling one’s most difficult trial, especially when the tragedy was entirely avoidable. You weren’t overly emotional and angry in your piece — though you have every right to be –which, in my opinion, makes your article all the more able to influence and inform others. Your story cannot be easily discounted. Thank you for writing it. 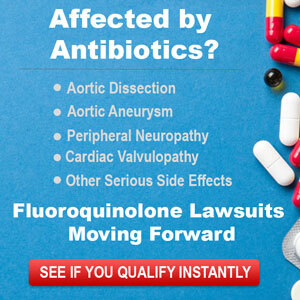 Hopefully we can continue to educate the public, and even physicians and pharmacists, of the grave risks involved with fluoroquinoloines.